As a nod to all my American friends - *wave*- I decided to do a post in honor** of all the 4th of July celebrations happening on your side today. What I wouldn't give for some sun-time and freshly grilled lamb chops right around now... Although, I'm kinda glad I don't have to be braving summer clothes and especially swimsuits at the moment. Silver lining, people, silver lining. But I digress. I have found the perfect use for leftover bbq chicken. Or, even oven grilled chicken if you happen to be in the colder parts of the world. Okay fine, I didn't even grill my own chicken. It was the leftovers from our supper at a Portugese restaurant on Friday to celebrate my new dayjob (can I get a big woooooooooot?). So, now you know all my dirty secrets. This salad though - it's gooooood. TheHusband didn't say anything yesterday, but I could feel him giving me the evil side eye while I was preparing said salad yesterday afternoon. I'm sure he thought I'd gone off my rocker for good. I mean, there he was, sitting on the couch under a duvet (snuggling kitty in place of course), and there I was, plucking fresh salad leaves from the herb garden and chopping crunchy apples. 1. Heat a small amount of olive oil in a medium sized frying pan over medium-high heat and saute the onions until starting to soften. Add zucchini and cook a further few minutes until the onion looks glazed and the zucchini is tender. 2. Meanwhile, remove chicken from the bones, roughly chopping the meat into bite sized pieces. 3. 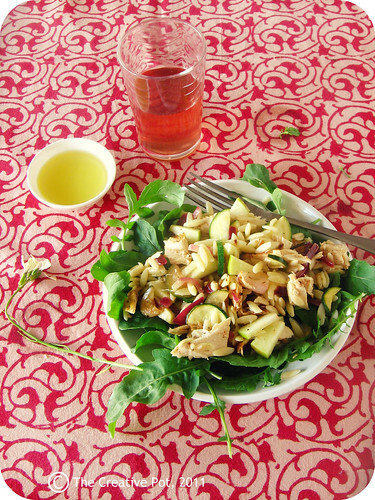 In a big salad bowl, combine onion, zucchini, pasta, chicken pieces and apple. 4. Make a dressing by mixing the olive oil with lemon juice, then pour over the salad. Mix and adjust seasoning to taste. 5. Serve on a bed of fresh rocket (aragula) leaves. Some other great add-ins for this salad would be a handful of chopped herbs (think mint, parsley, coriander, chives or even dill), diced avocado, chopped tomatoes or even chunks of pawpaw or slivers of pecorino. Also feel free to add a dollop of mustard to the dressing or even some finely chopped chilli. Thank goodness Mr cat left some for us to drool over. 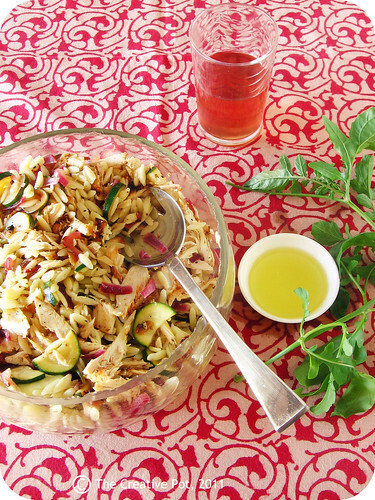 Love orzo, especially in a salad! At least YOU have an excuse for not wanting to wear a bathing suit! What are the rest of us supposed to do! This salad looks SOOO good. I love all of your mix-ins! Looks great! And warm salads are a great idea... I never feel like salad leaves in winter either, they always seem too chilly, but I did manage to make a salad to have with out baked potato supper today... even if I was the only one to eat it! Great idea and the salad looks yummie! I never had orzo before and bought a packet recently. I was infact to planning to prepare for our dinner. This looks lovely .. wish i had some chicken at home. very vegetarian .. great idea ..